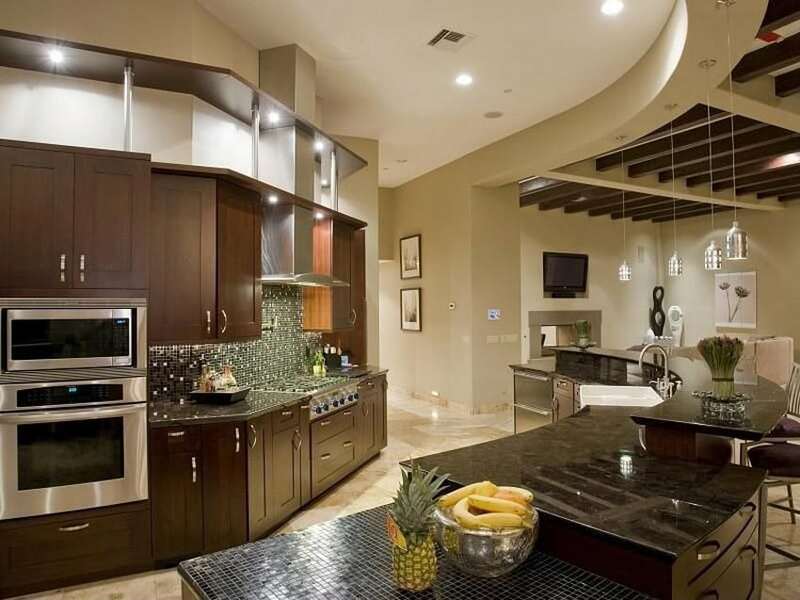 Welcome to our gallery of contemporary kitchen designs. These kitchens offer inspiration for upgrading your kitchen’s layout, storage, finishes, styles and more. 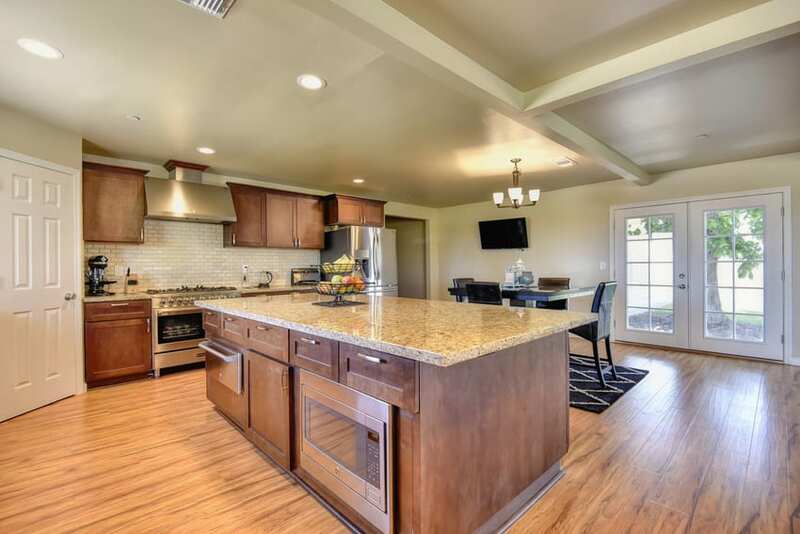 We hope these kitchens will provide plenty of new ideas for remodeling or upgrading your home. 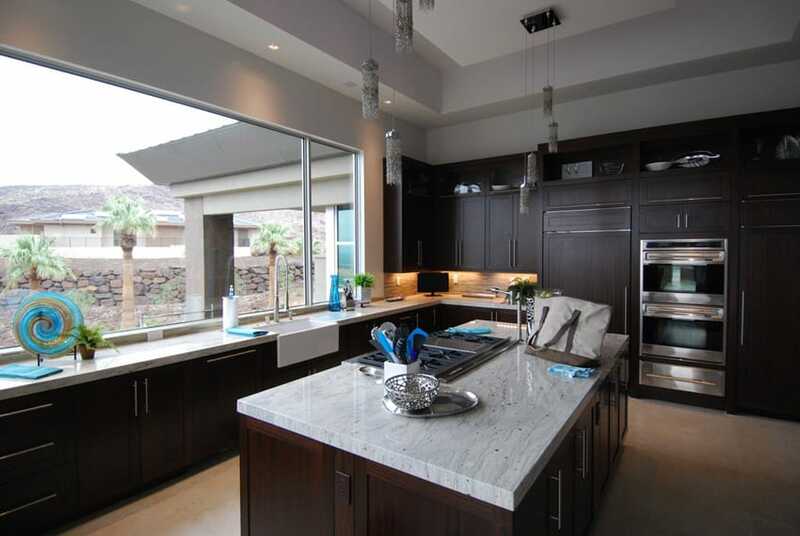 The kitchen above has a very modern feel, combining dark and light colors to create a beautiful contrast. Walls were painted in a modern dove gray color which helps bring out the natural beauty of the Mahogany kitchen cabinets and also help the white solid surface counters and the gray & white white back splash tiles pop out well. The barstools used on the kitchen island also matches the color scheme of the room, using white upholstered seats with Mahogany legs. Contemporary cabinets often blur the lines between traditional and modern. With clean lines, natural wood finishes and materials, contemporary cabinets look both bold and elegant. Some of the elements associated with contemporary cabinetry are the use of natural wood, simple straight lines & geometric shapes, and few hardware accessories. Here are some contemporary cabinet ideas to help you find the one that is right for you. See our latest gallery of contemporary kitchen cabinets here. This contemporary kitchen design successfully blends modern and traditional kitchen aesthetics, creating a timelessly beautiful design which will appeal to both modern and traditional design enthusiasts. The paneled solid wood cabinets is a combination of rustic walnut and picked oak, creating a nice contrast of light and dark wood finishes. The countertop material is white solid quartz surface for a modern seamless finish, but one of the two kitchen islands uses white soapstone to add a bit more color and pattern. A contemporary kitchen which uses traditional-inspired modular kitchen cabinets using solid wood doors in dark mahogany finish. This is paired with plain white solid surface counter top and glass mosaic tiles for the backsplash in various shades of gray which helps add texture and color to the surface. Combined with the white and gray walls and the wood finish floor tiles, this kitchen gives a modern yet warm and welcoming feel to it. 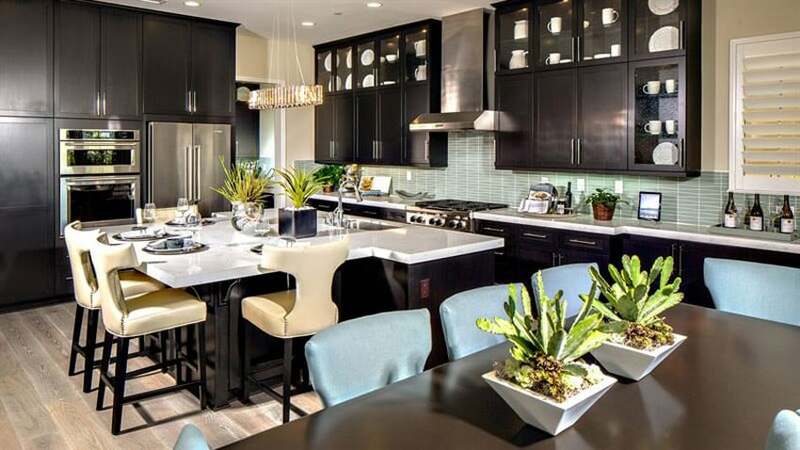 This contemporary kitchen has a dark color scheme and a large open layout, creating a large-looking kitchen which has a great balance of colors and textures. 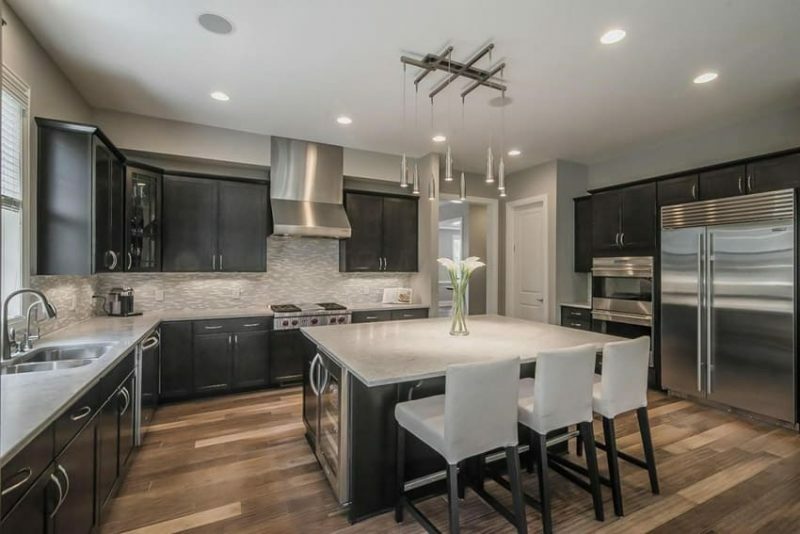 The kitchen cabinets are solid wood with modern paneling design in dark wengue finish, topped with dark gray solid surface counters which resembles concrete for the kitchen island, and black solid surface of the main kitchen counters. It uses a unique textured gray mosaic tiles for the backsplash, adding an interesting texture and element to the surface which also compliments the greige paint on the walls. The high ceiling of this contemporary kitchen enhances the over-all feel of the space, as well as give an impression of a bigger kitchen. 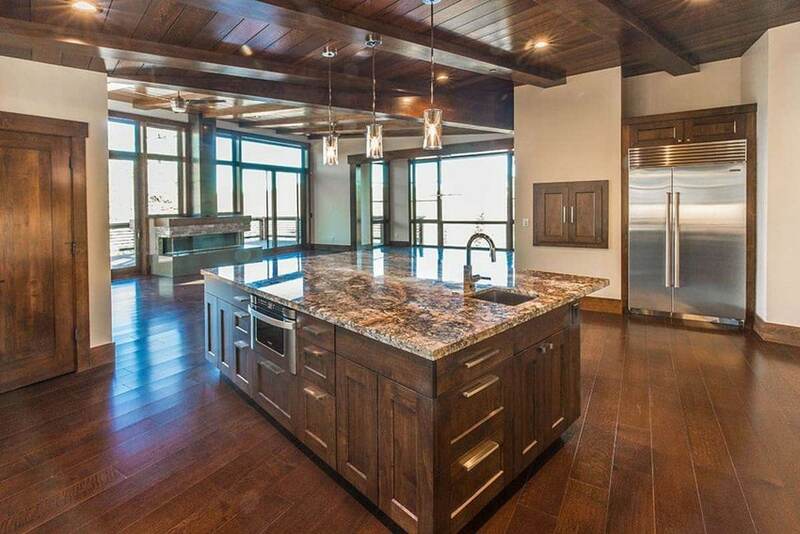 There is a combination of full-height cabinets, base counters & overhead cabinets, as well as a kitchen island. All of them were laminated in ash wood, giving a nice neutral gray color to complement the light cream colored walls. 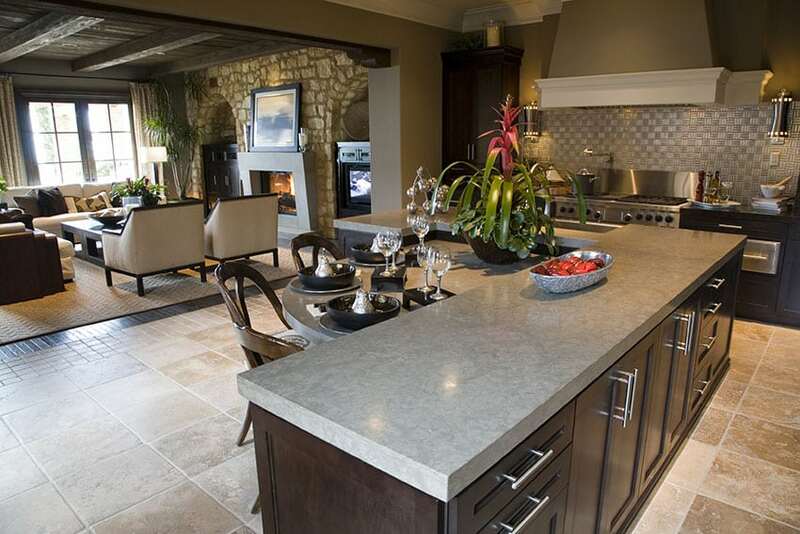 For the counter top & the backasplash, the natural stone used s in cream color as well, to match the walls. 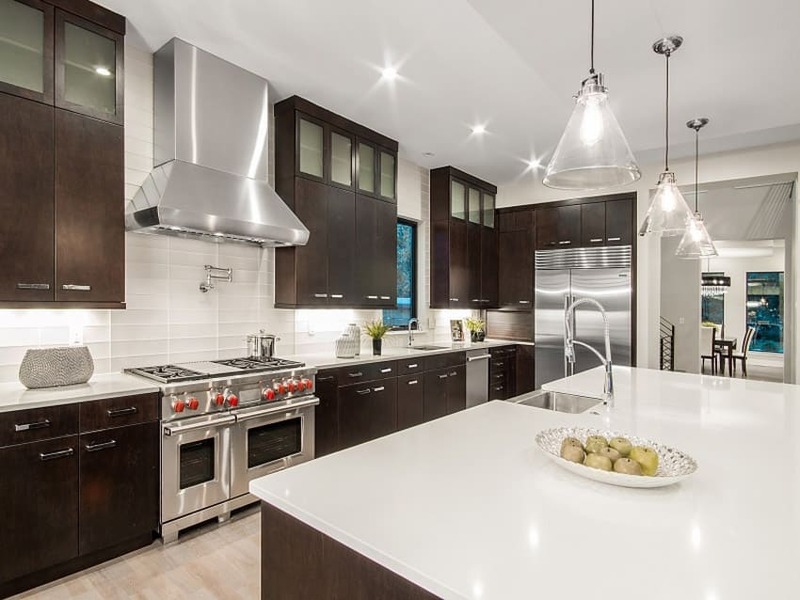 This is a gorgeous modern kitchen which uses elegant-looking solid mahogany kitchen cabinets paired with white soapstone with a flat nosing to create a very modern look, yet still provide additional natural patterns. 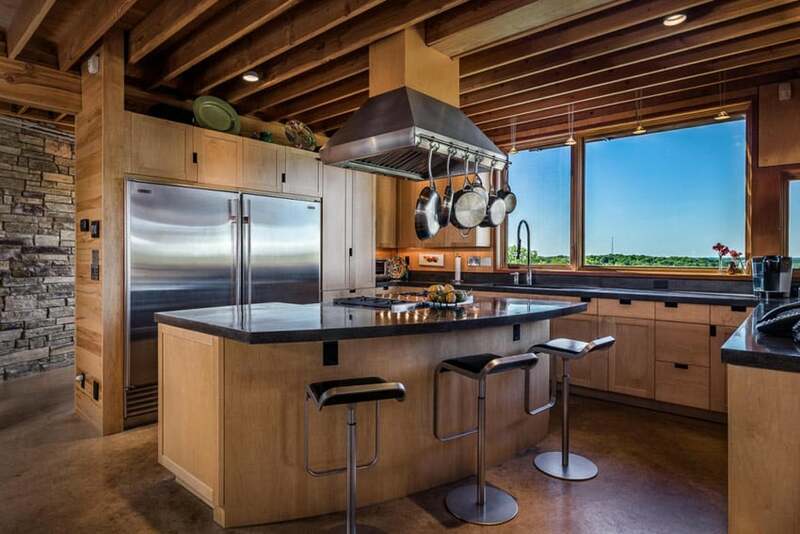 This kitchen also has massive picture windows by the counters, helping illuminate the kitchen, and bring some colors and elements of the outdoors seem to be part of the kitchen. Since this kitchen is quite large, and the overhead cabinet space is occupied by large windows, a full height cabinet was included in the design and a large kitchen island with additional cabinet storage. 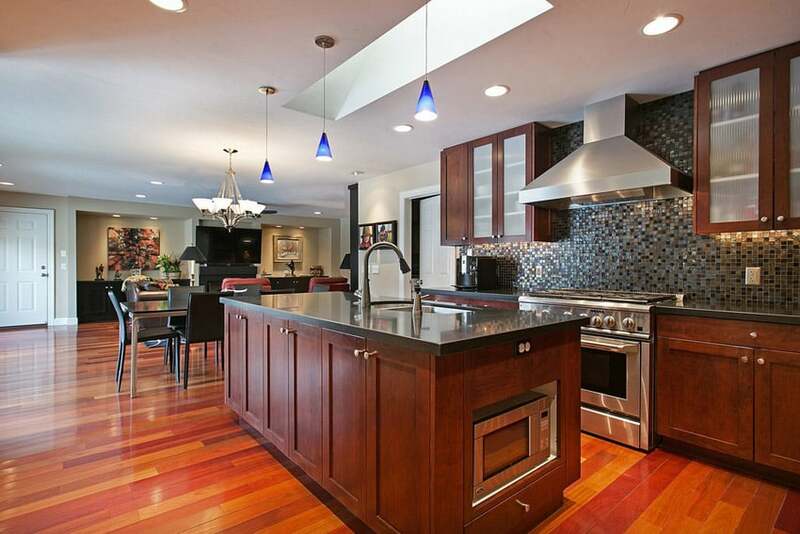 Going for a bolder look, this kitchen has a good balance of modern and traditional appeal. The dark Mahogany solid wood kitchen cabinets was combined with beige granite counter top material, giving it a more classic appeal. The gray floor tiles also add to the modern look of the space, while the vintage yellow walls complements the beige granite well. 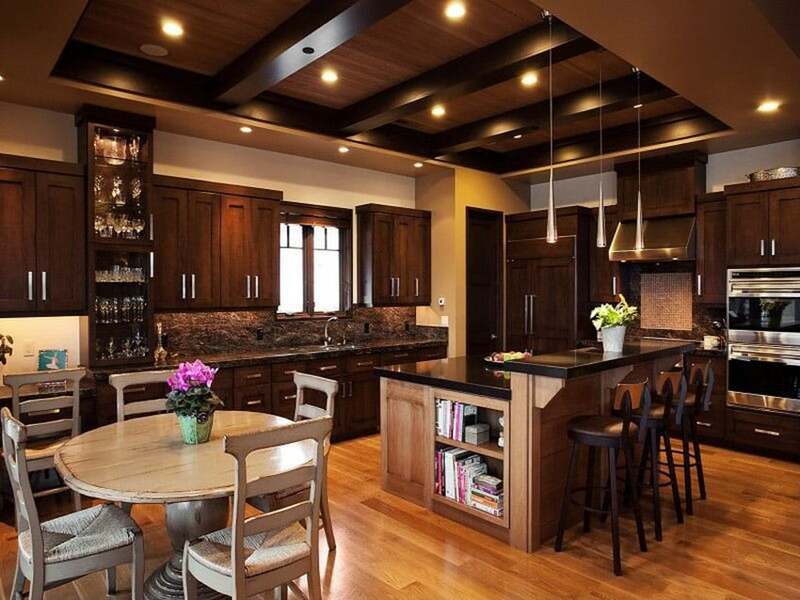 Using simple paneled solid wood cabinets finished in a dark cherry wood color, this kitchen has a very bold and loud feel to it, despite having neutral base surfaces. Walls are plain white and floors are light cream which also helps the red/orange tones of the cherry wood finish to come out really well. To add a more elegant element to the design, marble was the material of choice for the countertop, paired with beige, cream & brown colored glass mosaic tiles. Going for a more modern and masculine feel, this kitchen design goes for a simple black and white color scheme. Instead of using black laminates, however, it opts to use black duco finish on solid paneled doors to give it more texture and a more natural feel. To complete the modern look, the counter top used is plain white solid surface for a seamless look. 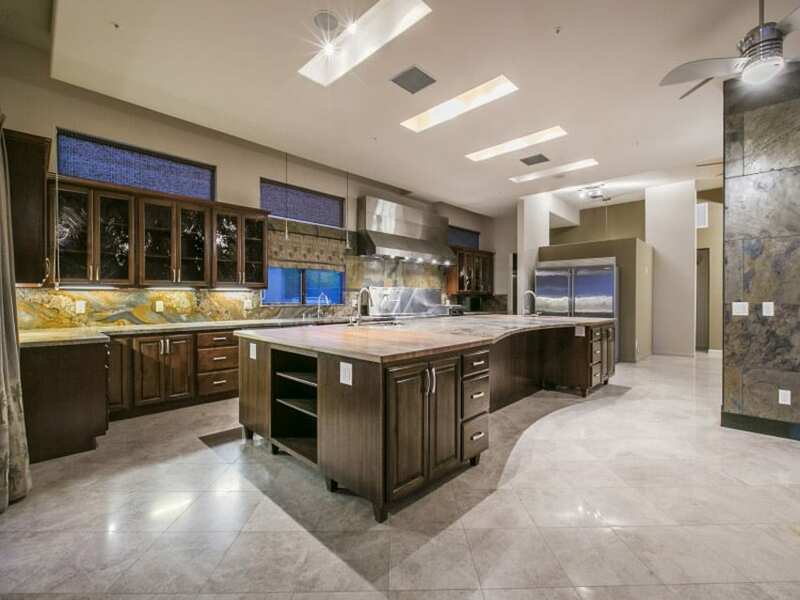 A large floor place and an open layout makes this kitchen look really large. The wooden kitchen cabinets has a matte duco finish, showing no wood grains, but showcasing the natural warm colors of wood. The orange tones of the kitchen cabinets matches well with the yellows of the golden walnut floors and the cream-colored granite countertop used. To add more texture, beveled whtie subway tiles were used for the backsplash. A contemporary kitchen design which is able to maximize the available wall space and ceiling height for additional kitchen storage. 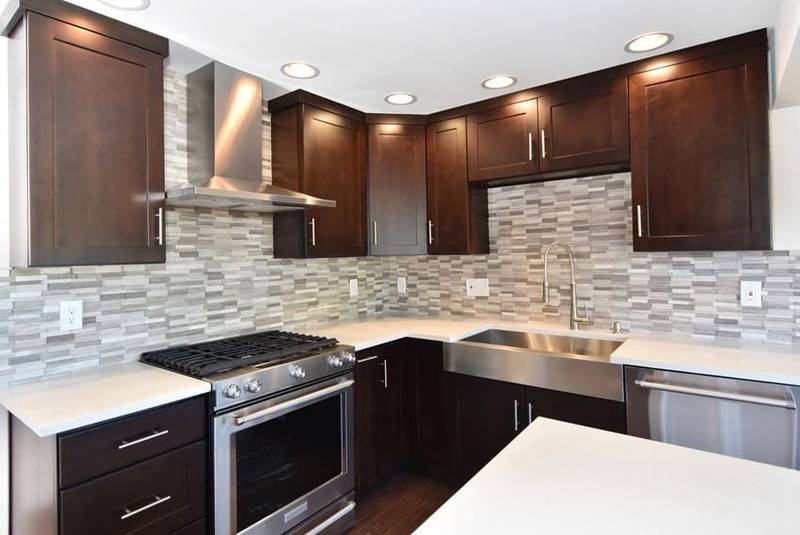 It features natural teak wood cabinets with solid black granite counter top and matching black mosaic tiles for the backsplash. You will see that the high ceiling is maximized by placing cabinets almost reaching the the around 3 meters high ceiling line. Due to excellent space utilization, it also has built-in dish racks and display cabinets which makes the plates accessible and visible. 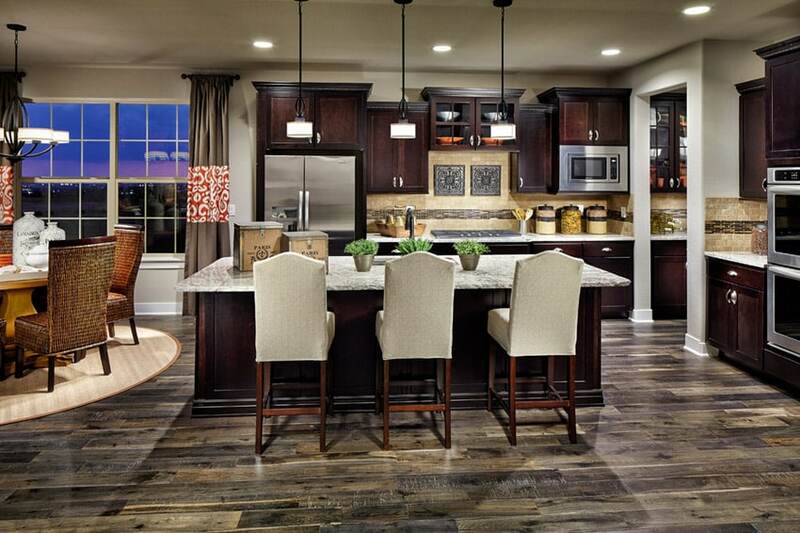 Over-all this kitchen gives a nice balance of warm and dark colors. Another modern kitchen design which uses duco varnishing technique to achieve that natural wood look. 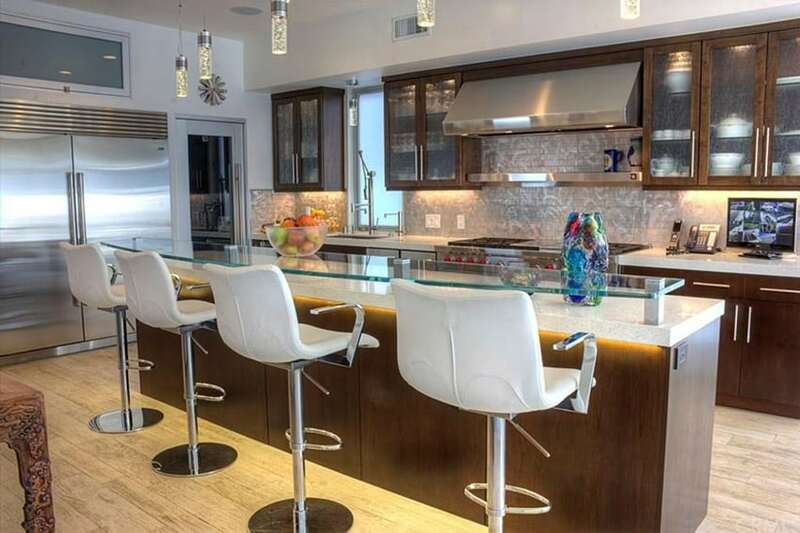 For this particular example, mahogany finish was applied on the simple paneled kitchen cabinets, topped with white solid surface for that seamless modern look. To complement the countertop are stone mosaic tiles in gray which not only adds a bit of color into the wall surface, but adds texture and pattern as well, making it look more interesting. One of the main elements in this kitchen design would be variety – this kitchen is not afraid to stick to one style only, as it boldly combines different finishes and styles. For the basic surfaces, we have cream-painted walls, light cream stone floors and ceiling with exposed trusses and cherry wood planks. 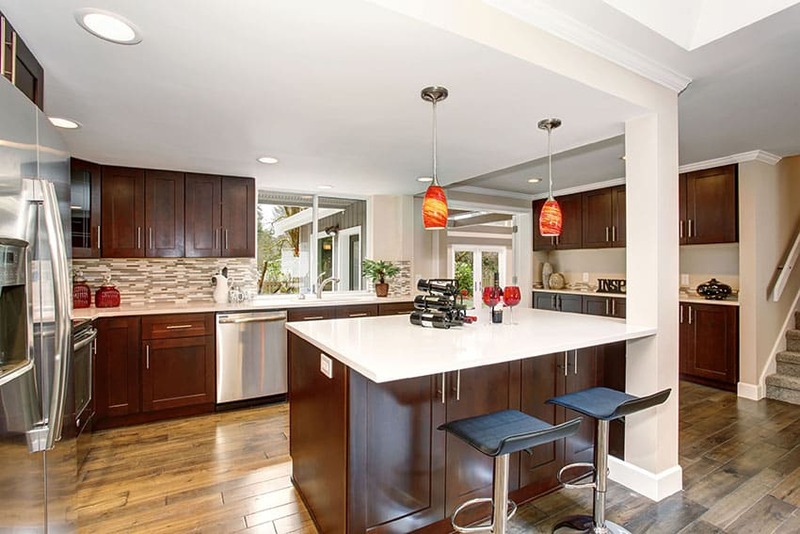 The kitchen itself on the other hand features a combination of classic style kitchen cabinets in solid mahogany wood and modern laminated cabinets. To help the two styles look cohesive, the same stone counters were used for both, while the kitchen island uses a different type of stone slab to complement the greenish tinge of the main countertop and backsplash. This kitchen fully utilizes the available wall space in order to place a full wall of cabinets for storage. 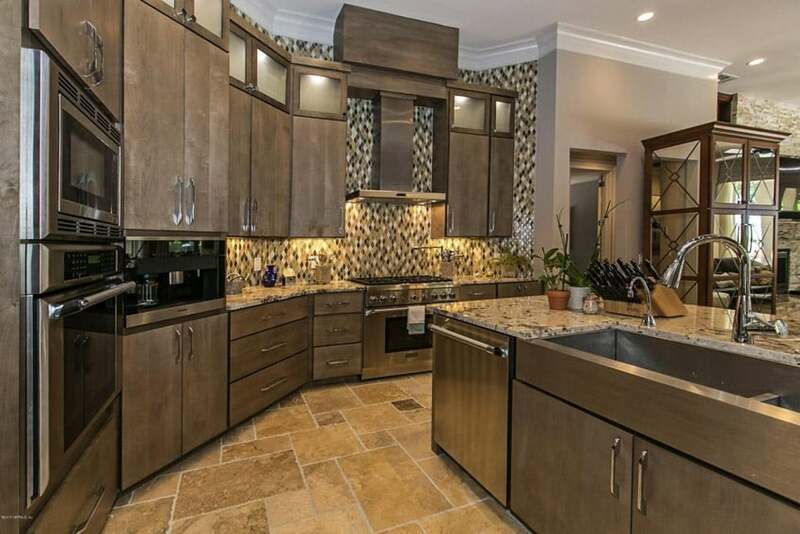 This contemporary kitchen uses gorgeous solid teak wood cabinets topped with beige granite for an elegant look and paired with gray mosaic tiles for backsplash. The wall in which the cooking range was placed against has stainless steel cladding on the wall for a more hygienic and easy-to-clean surface which would prevent dirt build-up. 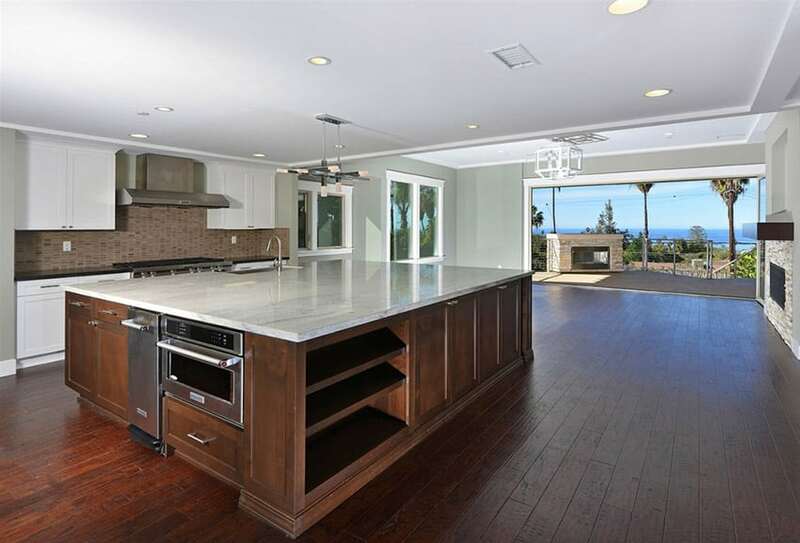 The open layout of this kitchen makes great use of the window views and opens in to the dining room. 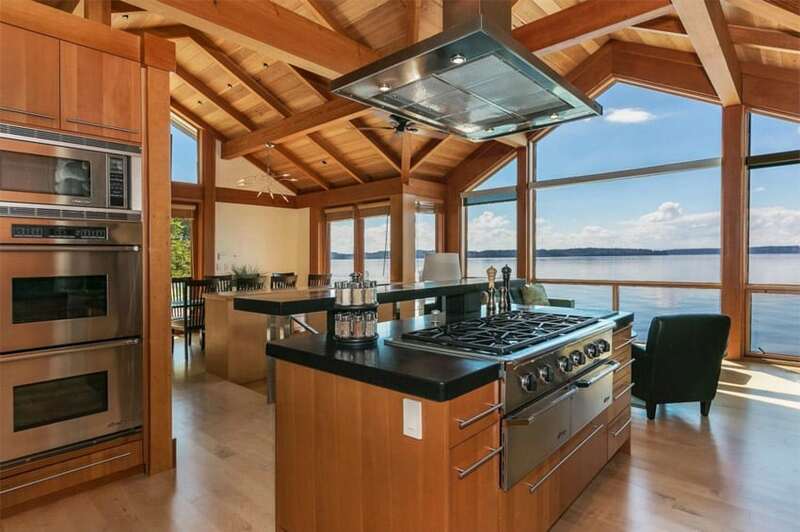 One of the main standout features of this space is the center island with its built-in stove and cabinets. 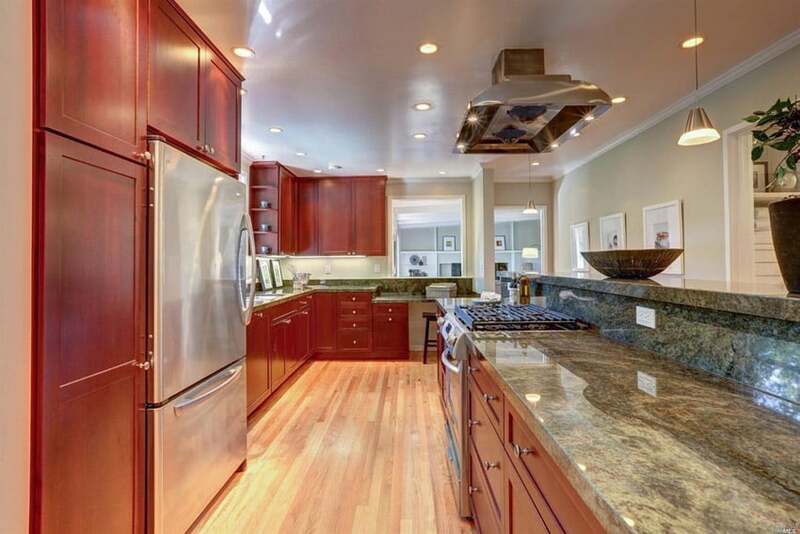 The rest of the space offers the same rich wood cabinetry with a brown granite countertop and engineered wood flooring. 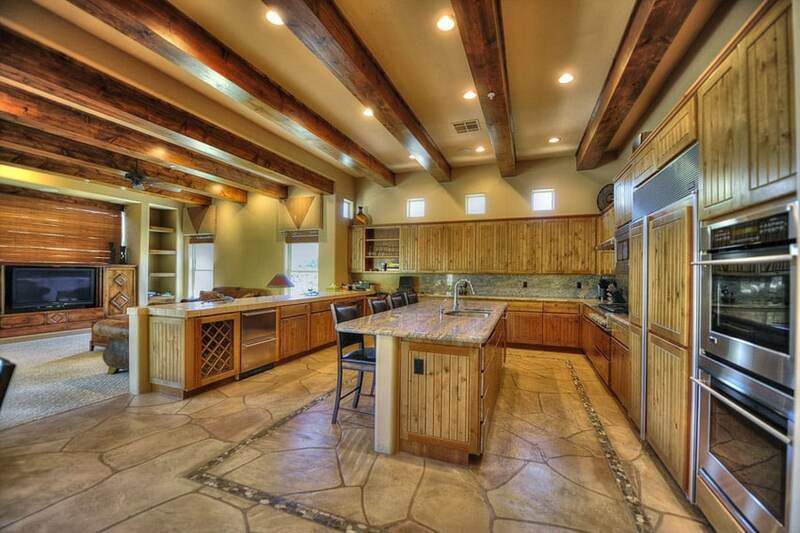 This kitchen has a more rustic and classic feel to it despite the use of modern modular cabinets. The solid wood doors uses rustic walnut wood, giving an over-all dark look to the kitchen, especially since the walls are already a bit dark as it is painted in gray. The ceiling is fairly high, and much of it is utilized for the overhead cabinet storage. For the countertop, white marble with prominent black veinings were used, and for the backsplash, diamond pattern mosaic tiles in different shades of brown were used, adding both texture and pattern to the space. The unique characteristic of this kitchen would be the geometric patterns and shapes applied in the design. 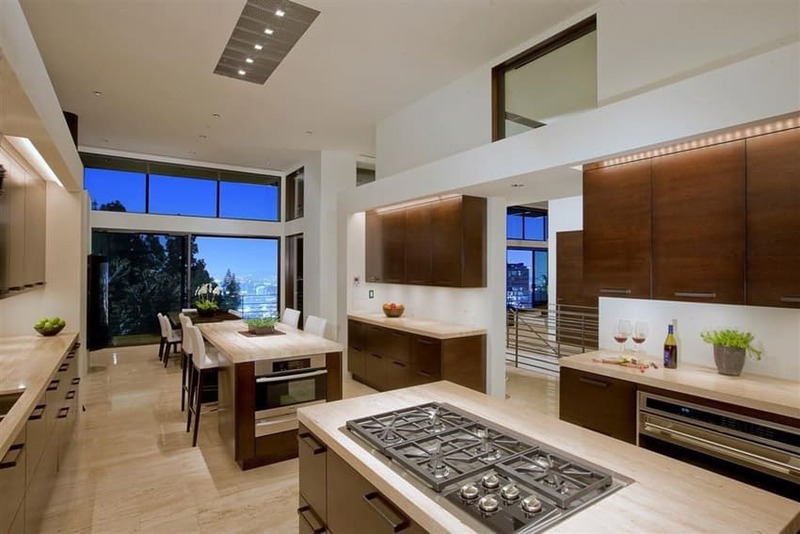 The kitchen itself is very simple – teak wood floors, white walls, solid wood kitchen cabinets in dark walnut topped with white quartz countertop. 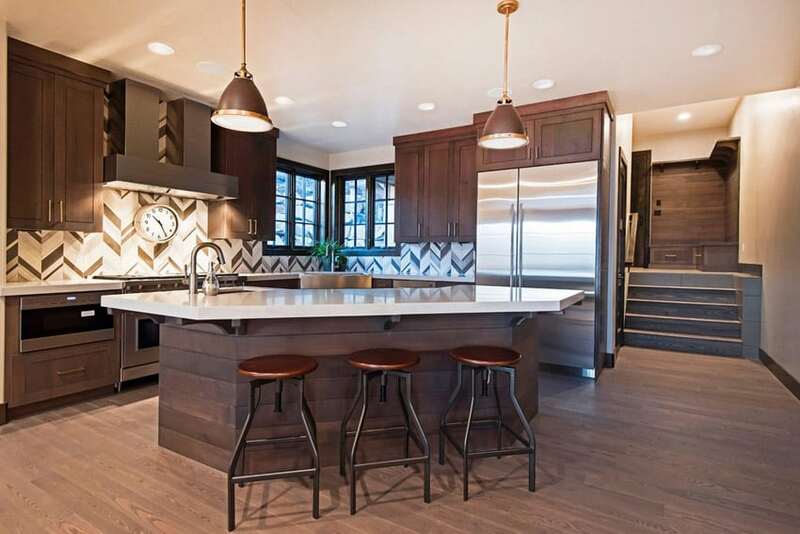 You will see that the diagonally-placed kitchen island has a unique geometric shape which somehow matches the chevron pattern of the backsplash tiles used. It also adds some industrial design elements, such as the bar stools with iron legs and the two pendant lamps over the kitchen island. The open floor plan makes this kitchen look really big, in addition to the fact that the living area is not yet furnished, which makes the view from the large picture window really visible from the kitchen side. The paneled kitchen cabinet doors is a combination of special walnut for the large kitchen island, and white painted finish for the main cabinets. 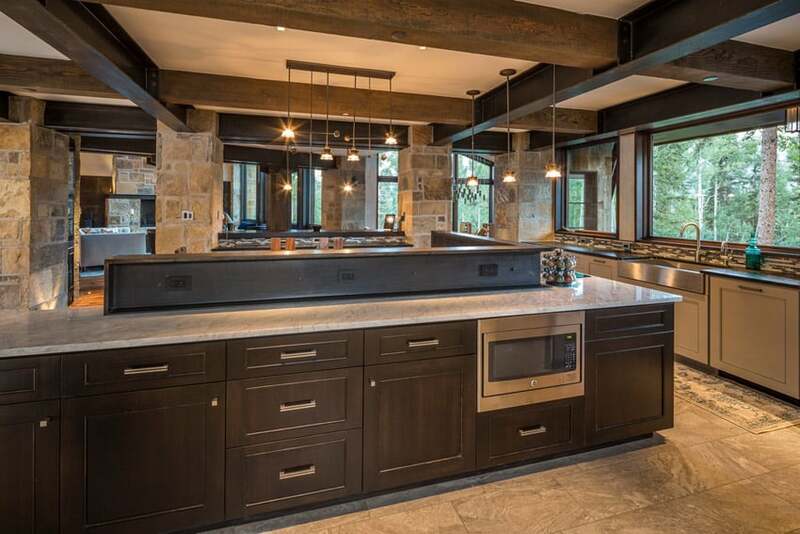 The massive kitchen island uses white soapstone with flat edging for its counter top, while the main kitchen counters uses black granite and clay stone mosaic tiles for the backsplash. This modern kitchen provides a lot of preparation surface which is ideal for multi-tasking and multiple kitchen users for an efficient traffic flow. This kitchen shares its space with a small dining area, but because of the high ceiling and large picture windows, the space looks really large and well-ventilated. There are two walls with kitchen counters and two bar counters, allowing much surface for food preparation and other purposes. Cabinets were uniformly laminated in walnut wood finish to match the color of the doors, while the countertop uses thick slabs of light cream sandstone. The other surfaces of the kitchen were kept plain – walls are white, even the backsplash is simply painted in white, while the floor tiles are natural polished sandstone as well in a light cream color. Despite the small size of this modern kitchen, the open layout of the house makes it look more spacious and airy, creating a light feeling. Reds are a prominent color in this design, especially since the floors uses bold solid cherry wood. This is combined with simple dark walnut cabinets, black solid surface countertop and black mosaic tiles. There’s also a skylight right above the kitchen counter, giving it further emphasis and adding more natural light into the space. 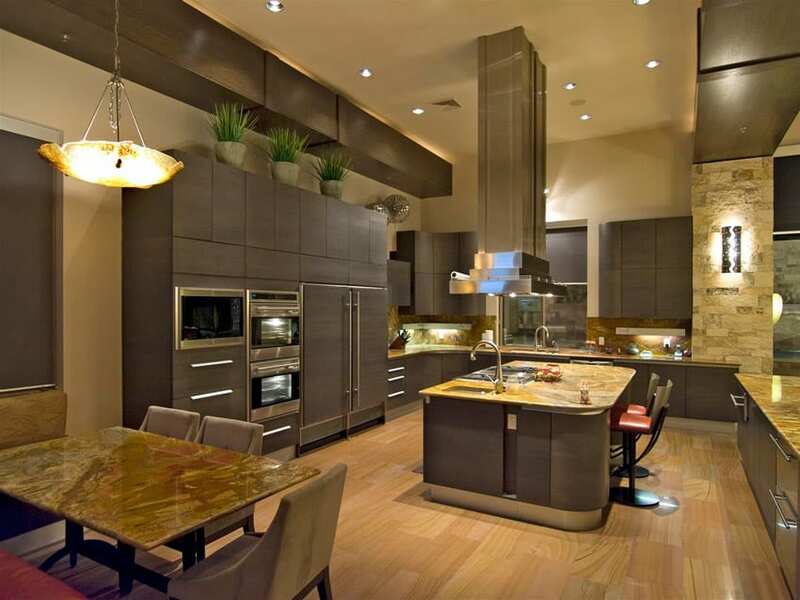 Contemporary kitchen designs like this have a modern look with today’s materials. This simple design offers a full kitchen counter wall with a bar counter on the opposite side, placed on an open floor plan. 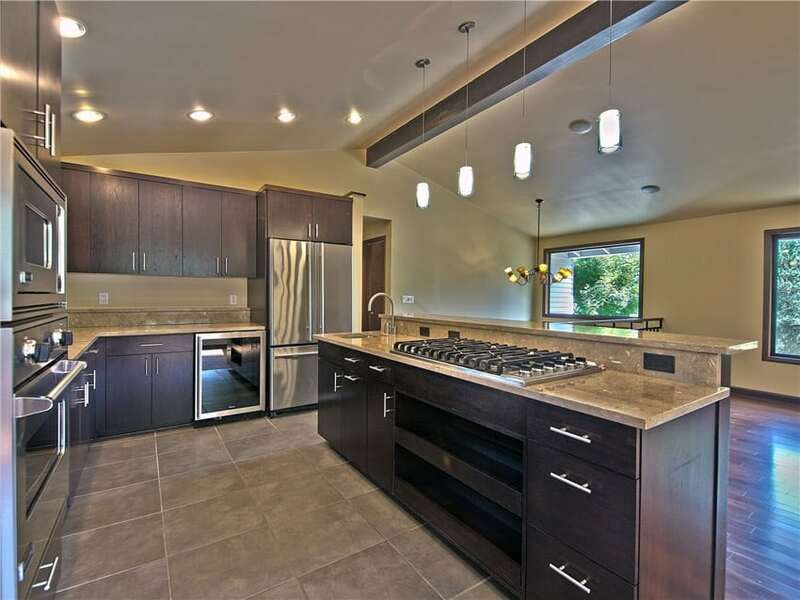 Cabinets are dark walnut with white quartz countertop. The backsplash tiles used is of a unique silver color which adds a unique texture to the space. 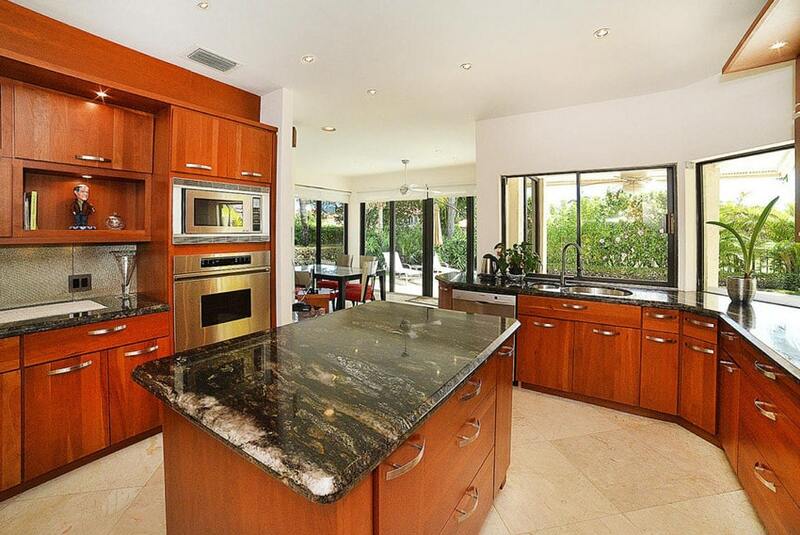 The standout feature of this kitchen is its very large island with plenty of under counter cabinet space. The walls of this full-sized kitchen is a combination of beige and plain white, paired with gray ceramic tile flooring. There isn’t much natural light in the space, so artificial light was used to compensate for the lack of it. 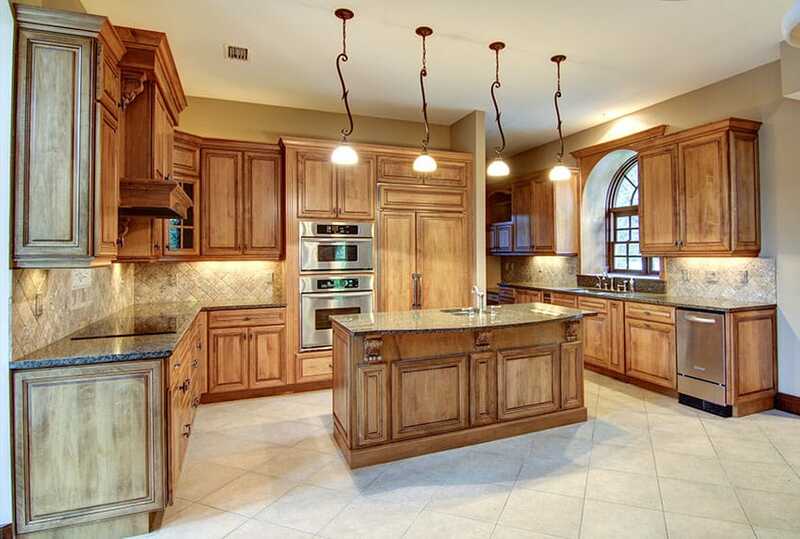 The neutral colors of the walls provides a nice background to the solid walnut kitchen cabinet doors & stone counters. A combination of mid-century modern and traditional pieces, this kitchen has a unique and refreshing look. 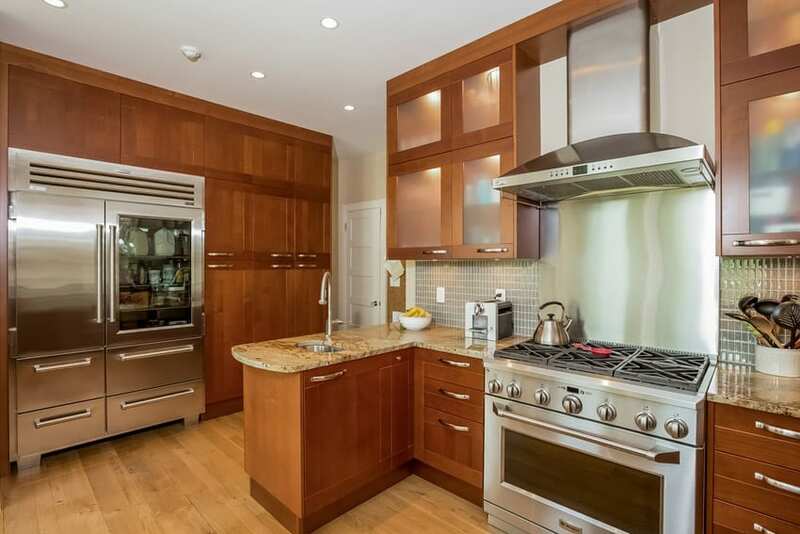 The kitchen cabinets uses a basic mahogany wood base with white seamless solid surface counter too and back splash. 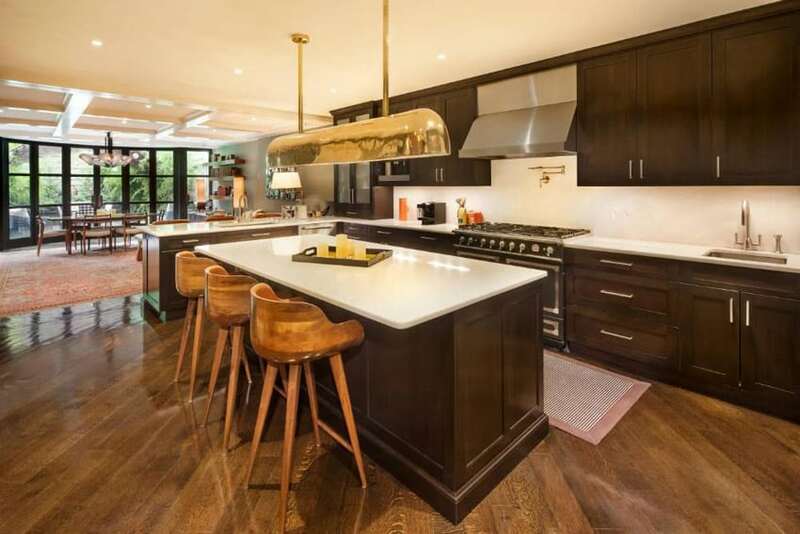 Giving it a more retro feel are the gold-plated fixtures, the solid wood mid-century style barstools and the gold drop light hanging above the kitchen island. A modern kitchen which maximizes the bright white background by using dark Mahogany solid cabinets. Due to the light background, the color of the cabinets really comes out nicely. For the counter top, white solid surface was used for a seamless counter surface. With a neutral background and excellent natural lighting, it is easy to use darker colored kitchen cabinets and counters without making the space look dark. This is very much taken advantage of in this design. Dark Mahogany kitchen cabinets with a gorgeous polished finish was combined with black granite counters to create an elegant modern yet look. The kitchen has a unique layout and orientation because of its location at a corner area of the room. 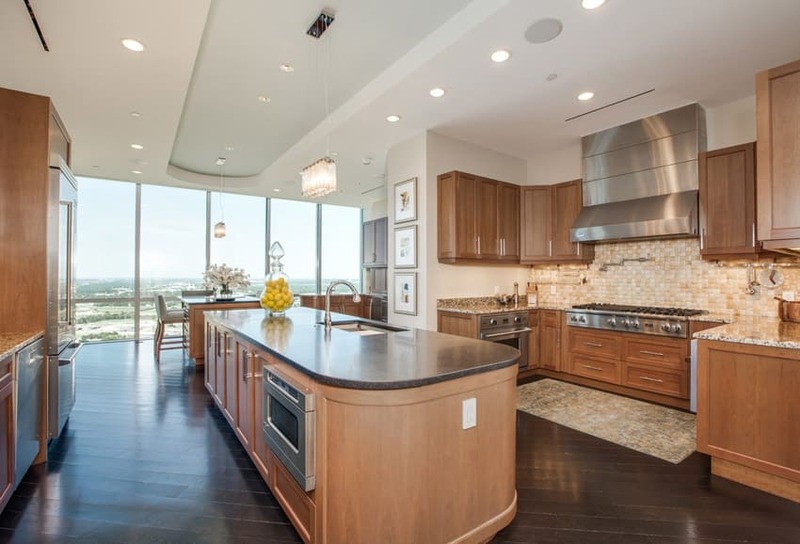 The kitchen is separated from the rest of the space with a quarter circle kitchen island counter. 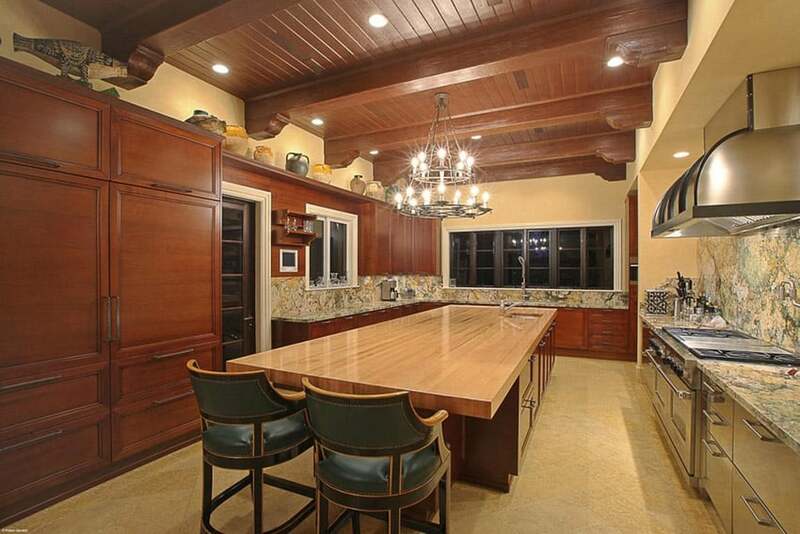 Mahogany is the choice of wood for the cabinets as it matches the ornamental wooden beams on the ceiling. For the counter top & backsplash, black granite & black mosaic tiles was used respectively. A modern kitchen with a darker over-all ambiance. The natural stone cladding on the columns, exposed wooden trusses and metal I-beams painted in black adds both a rustic and industrial feel to the space, giving it a very unique appeal. Despite the dark feel of the space, there is sufficient natural light coming from the large picture windows of the house. 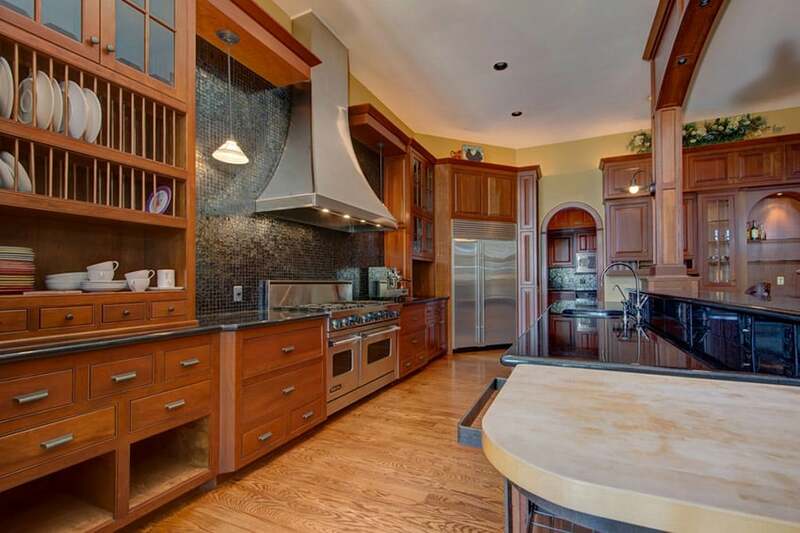 The kitchen cabinets sprawls across the whole kitchen especially since there is no space for overhead cabinets. 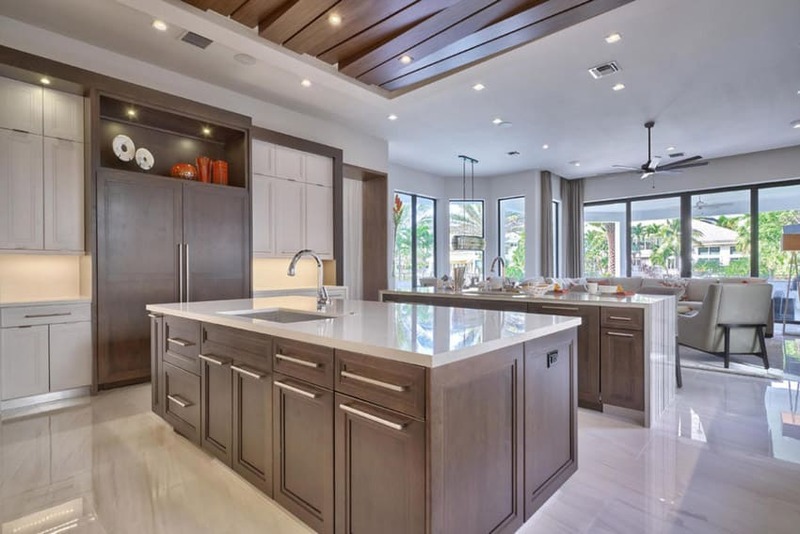 The main kitchen counters have solid wood doors & carcass painted in a light gray color, while the L-shape island/bar counter uses dark mahogany wood finish. The countertop material used contrasts with the base cabinet, and as such, white marble was used with the mahogany base, while black granite was used for the gray base. Wood finishes used in one space doesn’t always have to be uniform to create a cohesive design; variety is very much welcome in the right combination as demonstrated in this kitchen design. You will see that the floors are natural teak wood, combined with red Mahogany for the main cabinets, light walnut for the kitchen island and rustic white finish for the small dining area. Despite the variety of wood finishes used, it still looks balanced and elegant. 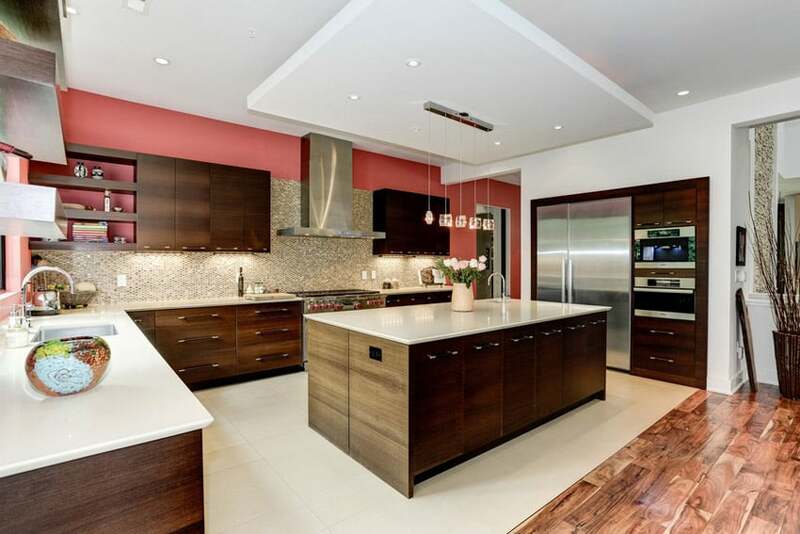 Using red Mahogany wood for kitchens, this modern space achieves an Asian tropical feel for its kitchen. 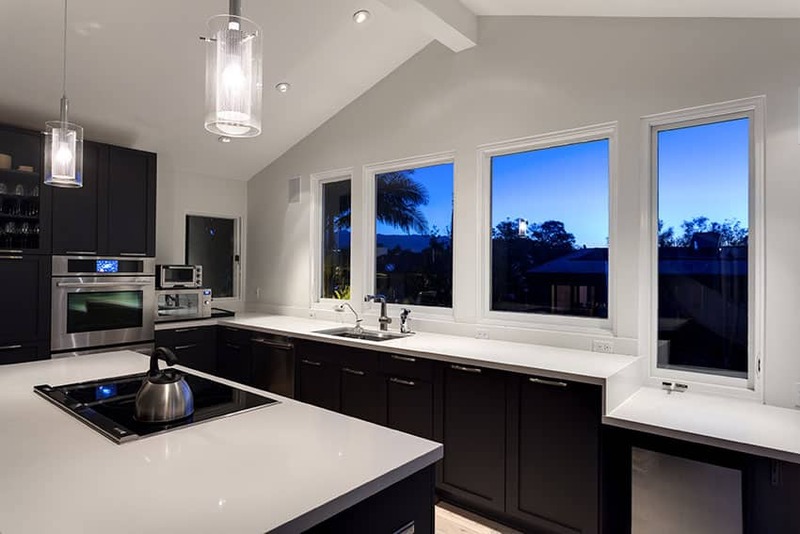 The spacious kitchen uses uniform cabinets topped with black marble, and despite the dark color choice, the white walls and large windows helps balance of these dark colors & create a bright looking kitchen. Large panoramic windows provide much natural light in this large apartment kitchen, which makes the space look really bright despite the gray ash wooden floors. Since the floors are already dark, the kitchen used a lighter maple wood which pops out nicely against the gray floors combined with gray solid surface counters to match the flooring. The result is a very coordinated modern look with a classic touch. This kitchen demonstrates a good balance of classic & modern aesthetics, effortlessly combining the two to create a modern traditional-inspired kitchen. The cabinets used are solid Light maple with simple paneling detail. This is paired with marble subway tiles for the backsplash, gray quartz for the main counters & white marble for the kitchen island. A traditional kitchen design which conbines yellows and reds. You will see a full wall which maintains its original brick wall finish, giving this kitchen much personality and texture. All kitchen cabinets uses light maple wood which gives it that yellow tone, and for the counter top, black granite was used for that classic elegant look that looks great with any cabinet color or finish. 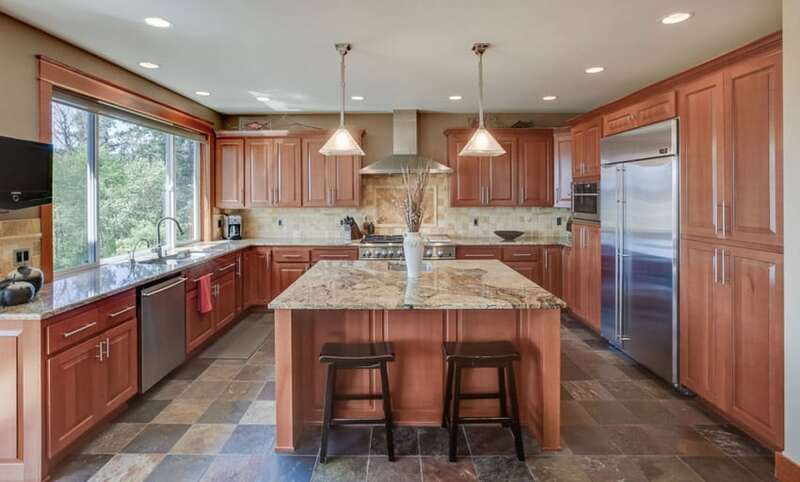 Using light and warm colors, this contemporary kitchen design is both seamless and inviting. The use of wood finishes makes it a timeless beauty, and the simple cabinet design will definitely attract those who love simple modern aesthetics. The dark gray granite used on the counters and the whole backsplash walls adds a perfect contrast against the light maple wooden cabinets, helping add a neutral color to the mostly yellow-toned room. 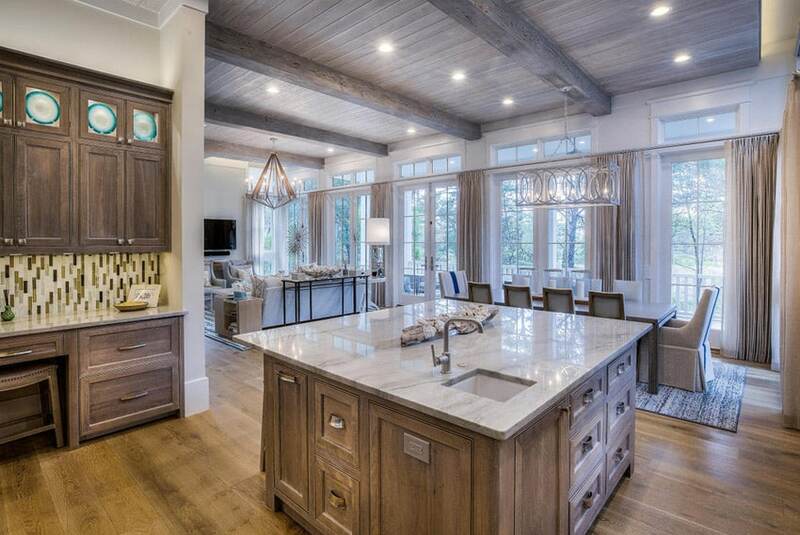 Rustic wood finishes used on the base cabinet of the large kitchen island matches well with the wood used on the ceiling, floors and the doors. The rustic appeal of the wood finishes gives this kitchen a raw and country-like look, yet the smooth & streamlined edges still give it that modern appeal. 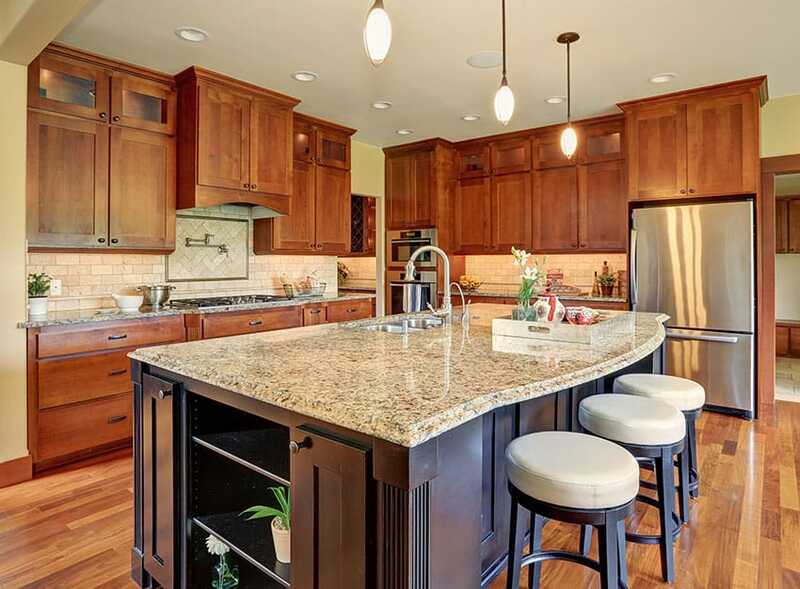 On top of this kitchen island is a solid slab of granite, which adds to the elegant appeal of the kitchen, further highlighted with the use of 3 glass pendant lamps to bring attention to the island counter. The use of dark wengue wood for the kitchen cabinets creates a good contrast against the light yellow walls of the space. The contrasting combination has a very modern appeal, but the simple paneling and cornice detail of the cabinets still gives it a classical touch. Sage green mosaic tiles were used for the backsplash adding a subtle yet refreshing pop of color to the surface. This is a very gorgeous modern kitchen with a little country style inspiration. 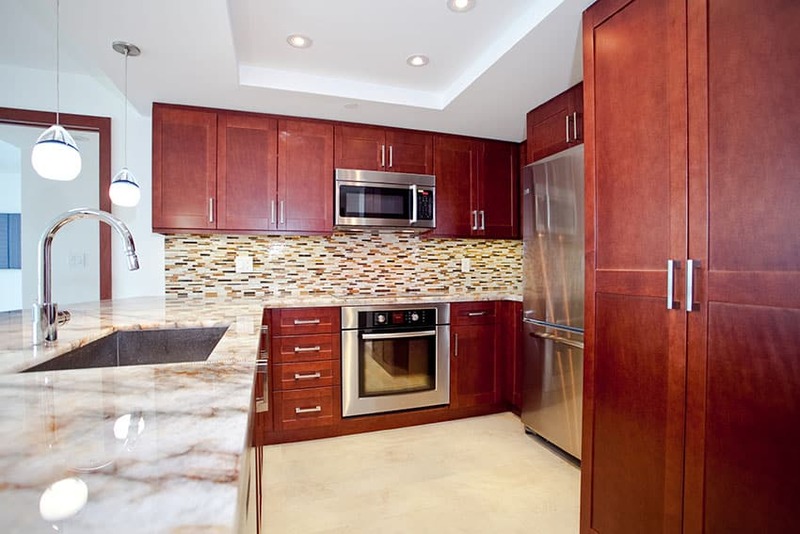 The colors used create a very warm & bright environment which makes this kitchen very pleasing to work at. 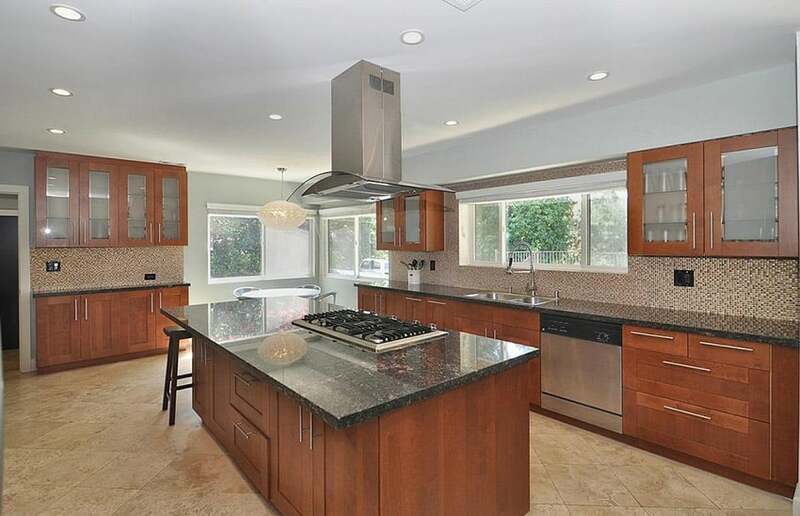 Floors are light solid maple & walls are plain white, giving way to the solid Teak wood cabinetry. Kitchen cabinet doors have horizontal wood panels giving it a country feel and a welcome additional pattern & texture. A classic style kitchen with a subtle modern twist. 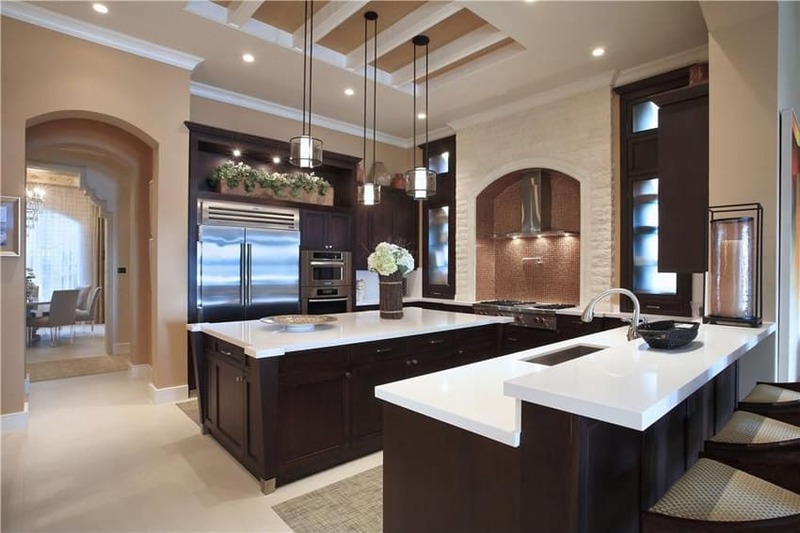 It uses classic style dark wengue birch kitchen cabinets with simple paneling design and cornice details. To give it a modern update, plain white solid surface was used for the counter tops, creating clean & seamless look which is a nice contrast against the wengue cabinets. With its dark wood cabinetry, dark wood flooring and light color granite countertops and tile backsplash this kitchen offers plenty of attractive contrast. Full of beautiful touches like the backsplash with inlay and mosaic tile runner this space is inviting and warm. the large eat-in dining island and open plan is great for entertaining and hanging out with friends and family while meals are being prepared. This kitchen uses a unique coral-colored paint on two of its walls, creating a bold background surface for the modular kitchen cabinets. The kitchen cabinets uses natural Fruitwood veneers, giving you the gorgeous natural texture and warmth of wood finishes. To give it a more modern look, white solid surface was the countertop material of choice, maintain a slim profile for that sleek modern look. For the backsplash, white and silver mosaic tiles was used on one wall, adding a sort of glamorous feel to the surface. Going for a darker and a more sleek appeal, ebony wood was the material of choice for the cabinets of this modern kitchen space. The gray color of the wood comes out nicely against the plain light yellow walls. For the counter top, white solid surface was used on the main counters, while wood block was used for the kitchen island. You will also notice the use of silver mosaic tiles on the full wall of the counter giving a glamorous touch to the space. This space definitely maximized the gorgeous view of the lake by using a full wall as window which also helps illuminate the small interior space. 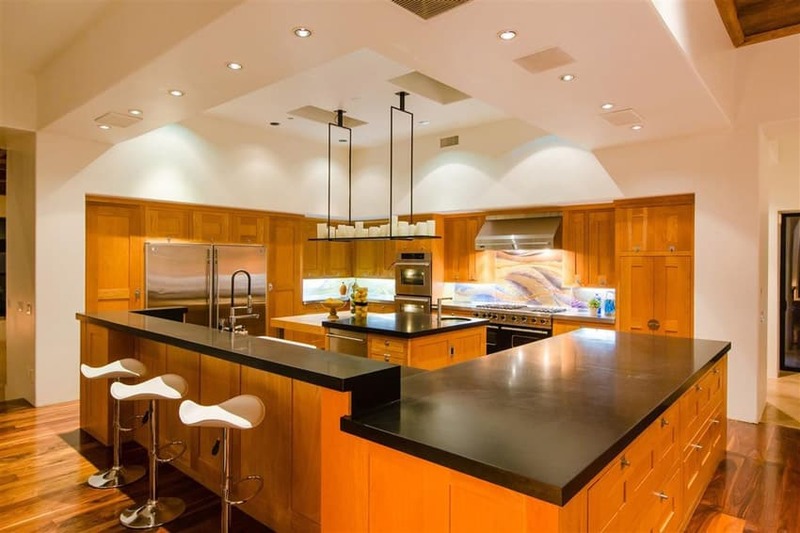 The kitchen simply matches the interior architecture of the space – cabinets matches the solid teak wood ceiling and beams which makes the look unified. 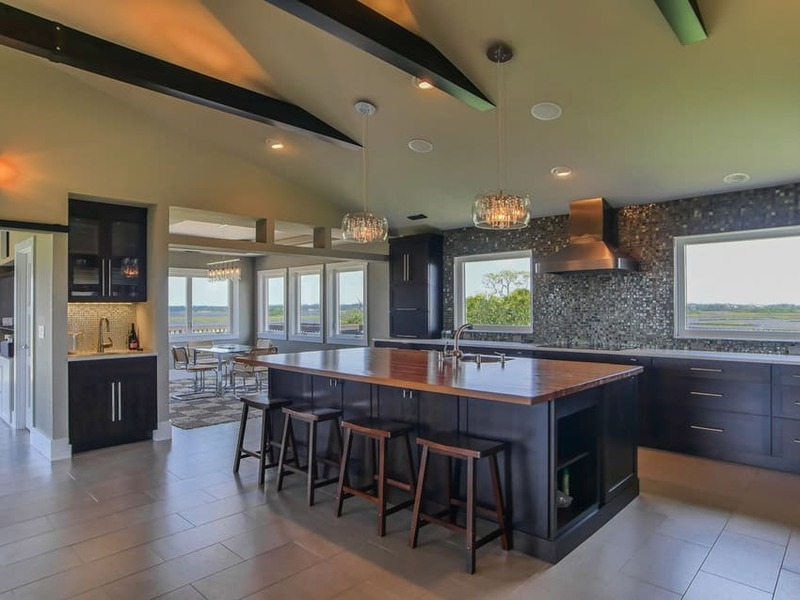 The use of black quartz counters adds a welcome contrast while maintaining its modern resort-look. Yellow tones are very dominant in this kitchen, as it focuses on the natural finishes of the materials used. Large blocks of natural stone was used in the floors, while solid Teak wood can be seen exposed on the ceiling. For the kitchen, natural solid alder in vertical slats was used for the cabinets. It’s natural finish and beadboard style gives it a country feel and also provides natural texture. For this small modern kitchen space, the beauty of natural teak wood was highly emphasized as the cabinets were placed against a light gray background. The wood used has a natural color variation, adding an interesting pattern to the surface. White solid surface was the counter top material of choice so that it won’t upstage the wood cabinets, as well as give it a modern and polished appeal. 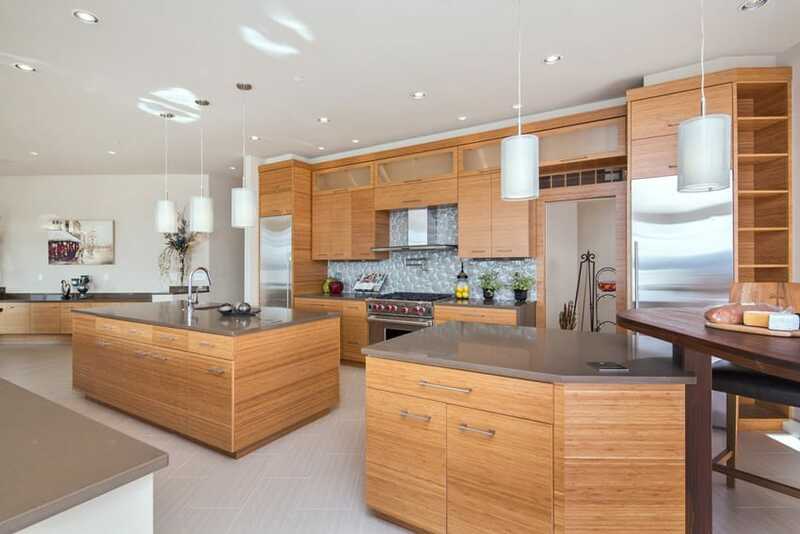 The white floors & walls of the space help emphasize the beauty of the Asian teak wood used on the kitchen cabinets. The natural horizontal grains of the wood add a natural pattern & texture to the space, as well as add a bit of warmth to the over-all feel. Gray slate solid surface was used over the wooden cabinets for a smooth seamless finish. 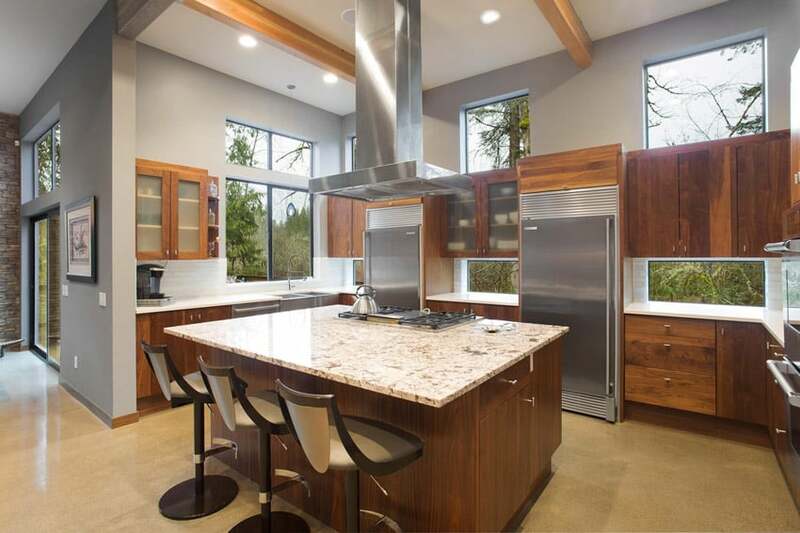 The natural beauty of pine wood is very much highlighted in this contemporary kitchen design. This kitchen is quite spacious, with a fairly high ceiling and a nice white neutral background which helps balance out the natural orange tones of the pine wood kitchen cabinets. These simple paneled cabinets were paired with matte black solid surface for that modern seamless look. The large space also allows for a full kitchen experience – an L-shape main working counter, a kitchen island and another L-shape counter on the outer corner for additional working area, and also serves as a bar counter and a divider between the kitchen and other parts of the house. Going for a softer, more feminine look, light cherry wood was used for the kitchen cabinets, paired with light beige painted walls & beige granite counters. The backsplash uses ceramic tiles which matches the color of the counter top material used, creating a well coordinated feel to the design. Slate floor tiles provide an interesting mix of colors to the space. 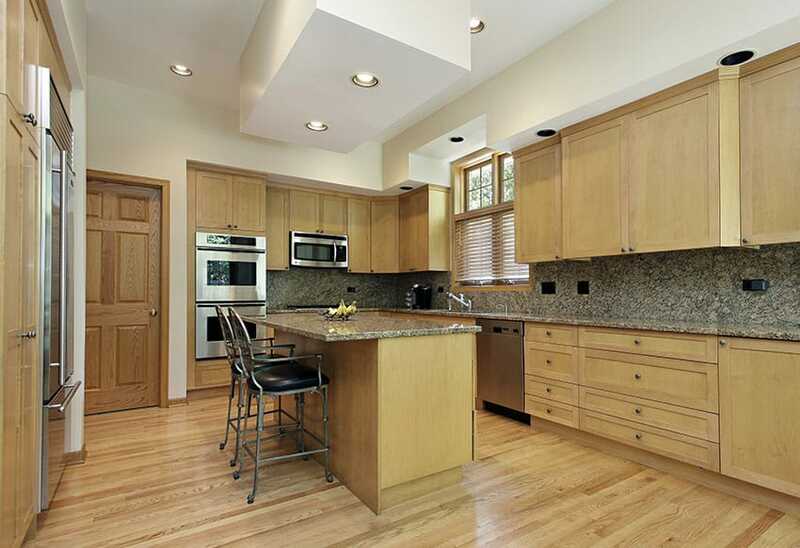 Using bold solid cherry wood for the kitchen cabinets, your eyes will naturally navigate towards the kitchen. The light sage green walls complements the red-orange tones of the wood nicely and is a great match to the solid stone counters as well. 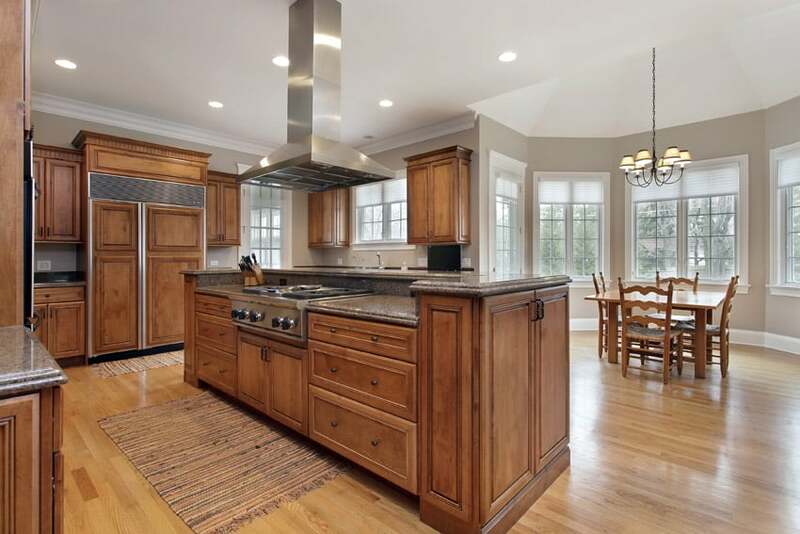 A gorgeous traditional-inspired kitchen which uses natural teak wood cabinets with a nice semi-matte finish and a wengue stained base cabinet for the large kitchen island. All counters used beige granite stone, and for the backsplash, natural stone subway tiles were used to match the counter top color. 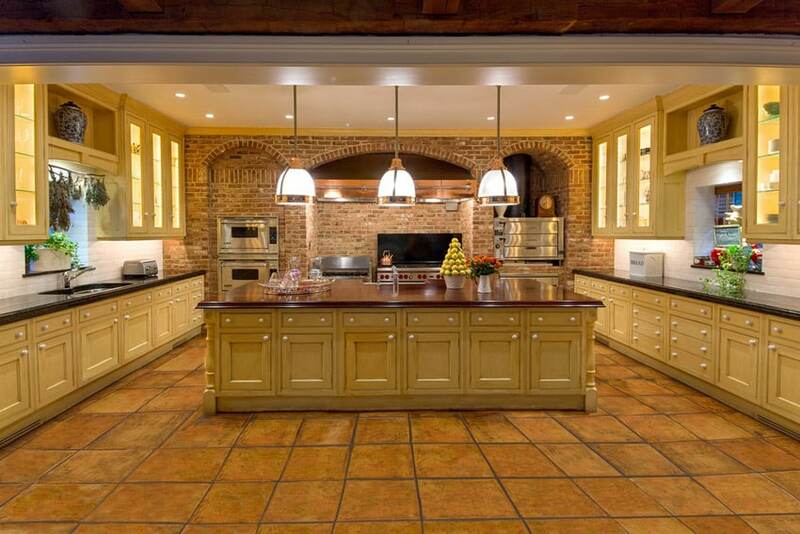 The yellow tone of the floors, walls and ceiling create a very antique / old feel to the space, and the kitchen seamless blends in this background despite having a more modern appeal. The kitchen cabinets are natural oak wood combined with flat-nosed black granite, while the barstools are black-painted metal which adds an industrial feel to the space. A rustic country-style kitchen with a modern touch which used beautiful solid light oak wood kitchen cabinets combined with classic Carrara marble with flat edging for a more polished and modern look. 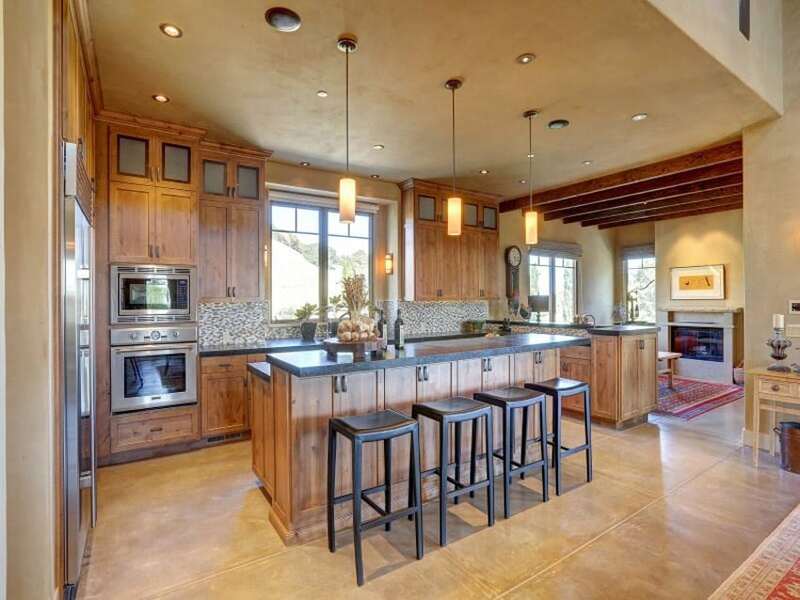 The open floor plan makes the kitchen less heavy despite the used of solid wood cabinets. Despite the limited space, this kitchen was well-planned so the space was excellently utilized. It also helps that the kitchen has a large window providing natural illumination for the space, to make it look brighter and bigger. Light oak wood planks was used on the ceiling so to create a seamless effect, the same wood was used for the kitchen cabinets. Black granite was used, and the door hardware used were also in black to give it a subtle industrial look. 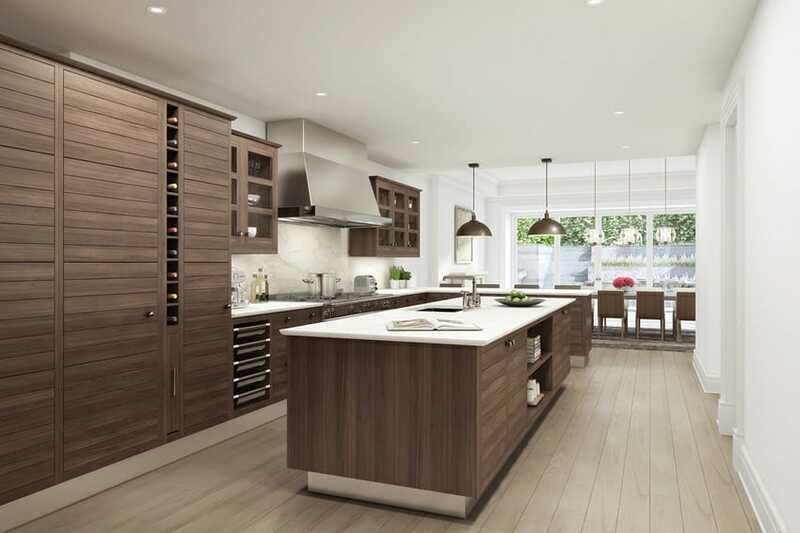 Contemporary kitchen designs with oak wood can help keep the space lighter. The light oak finish of the solid wood kitchen cabinets gives a raw, rustic appeal to this contemporary kitchen space. The kitchen is fairly spacious, separated into two areas: one is an L-shape counter with an island and another gallery kitchen on the side. 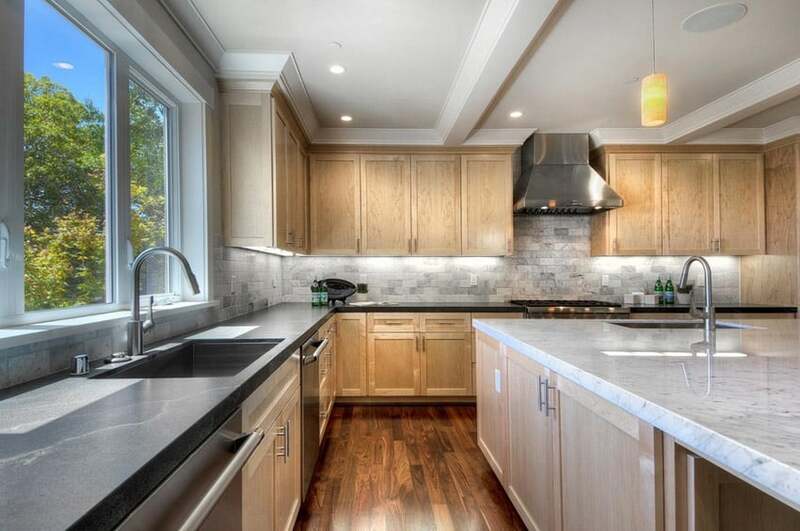 All use the same wood cabinets and black granite counter top, creating a clean, uniform look. The walls of the space were painted in a nice neutral beige color, adding warmth to the space, and for the lighting, warm white under cabinet lights as well as accent lighting were used.